The 10 Best Omelets in North Dakota! Americans love omelets, and North Dakotans are no different. Whether you prefer them plain or loaded with meats and veggies, sometimes nothing but that egg and cheesy goodness will satisfy your breakfast craving! If you find yourself in that position while in North Dakota, the following restaurants will take good care of you. If you are looking for great food in an intimate setting, this is the place for you. The meals are reasonably priced, but that doesn’t mean they are short on flavor. All omelets are served with fresh hashbrowns and either toast or pancakes. The Hooligan Omelet, made with The Shack’s famous homemade chili, is a particular favorite. A newer restaurant in the Red River Valley, Deaner’s Diner promises “home-style cooking just the way you like it.” Breakfast items are served all day and omelet dishes include the Five Cheese (made with Pepperjack, Swiss, American, cheddar and Monterey), the Meatlovers (which includes ham, sausage, and bacon), and the South of the Border (made with taco meat and jalapenos). Located inside the Radisson Hotel, Zest has mastered the art of omelet making. Although breakfast is served all week, Sunday brunch is where the real magic happens, and made-to-order omelets are the star of the show. Meats include the usual suspects with the addition of chorizo, salmon, and filet medallions. The amazing sauces include hollandaise, béarnaise, fire roasted salsa, béchamel. Another place to find breakfast served 24/7, the Fryn’ Pan has been a breakfast lover’s haven for many years. All food is made fresh and served just the way you like it. 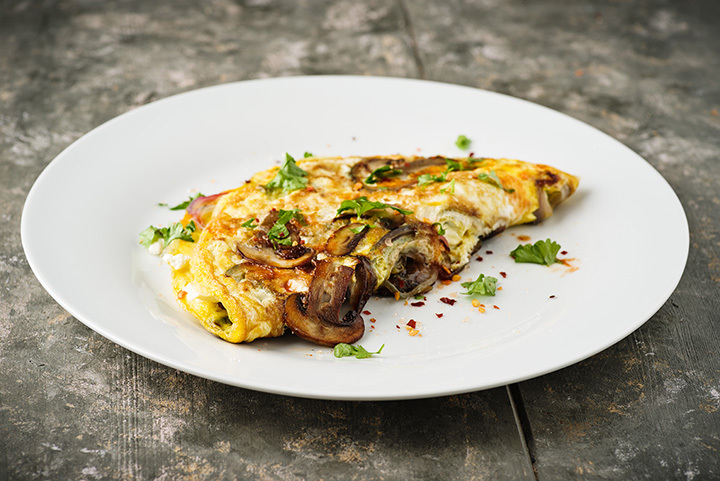 Their most popular omelets include the Trim ‘n Fresh (featuring cholesterol free Better'n Eggs filled with mushrooms, onions, tomatoes, spinach and Swiss cheese) and the Supreme (which includes diced ham, mushrooms, onions, green pepper and American cheese). Located inside the Grand Cities Mall, Del’s has been known to attract breakfast diners from all over eastern North Dakota. Make sure you arrive at Del’s hungry, as many people aren’t even able to finish the restaurant’s oversized omelet plates. There is nothing fancy about Del’s, but when the food is this good there doesn’t need to be. Another no-frills restaurant that serves amazing omelets, Northside Café serves dishes that taste like they were homemade in your grandmother’s kitchen. If you are a ham and cheese fan, Northside will ruin you for other restaurants with an omelet stuffed with a much ham and cheese as is physically impossible. All omelets come with homemade pancakes, which are also out-of-this-world. Made in 1965, this cozy dinner will make you feel like you are one of the family from the time you walk through the doors. The omelets are made with eggs so soft and fluffy you will never look at another egg dish the same. A family owned and operated restaurant that has been serving up breakfast goodness for decades. Part of the Schatz Crossroads Truck Stop, the restaurant is much more than just a greasy spoon. Whether you are passing through or craving breakfast in the middle of the night, Schatz will take good care of you. Their Country Omelet made with seasoned country sausage, onion, green peppers, Swiss. and American cheese is a diner’s favorite. One of Minot’s oldest restaurants, Charlie’s knows a thing or two about breakfast. Located in the heart of downtown, it serves breakfast all day, which is good news for those craving an omelet at strange hours of the day and night. Try the fajita omelet (made with chicken fajita meat, onions, green peppers, American cheese, and a side of salsa) or the All-American Omelet (ham, onions, American cheese, hash browns inside, cheddar cheese sauce on top). Don’t let the size of the restaurant fool you, the Depot knows breakfast. Omelet options include the usual combinations, but their flavors are extraordinary. Don’t forget to order a side of pancakes, as their fluffy goodness will put you right over the edge.